When I saw the title of Ten Dumb Things Smart Christians Believe: Are Urban Legends & Sunday School Myths Ruining Your Faith? I needed to see if it was for real or if it was something inspired by Satan to lead people astray. What I found was an easy reading book debunking “Spiritual Urban Legends” with references to the Bible and the words of Christ. It was easy reading, but powerful in what it said and how it made me think. Faith can’t fix everything, not everyone “goes to a better place” when they leave this earth, Christians shouldn’t judge, and seven other things you probably heard every week in Sunday School growing up and in Sermons as an adult. Reading Ten Dumb Things and deciding for yourself if Larry Osborne makes his case that the ten things are truly dumb will give you a lot to think about and help you walk closer as a follower of Jesus of Nazareth. Christians today tend to think of Pharisees as stubborn fools for sticking to the traditions of the elders rather than accepting that Jesus of Nazareth was the Messiah and the true Son of God, sent to save the world from sin and death. What Ernest DeWitt Burton and Shailer Mathews had to say over 100 years ago about Mark 7:5 in The Life of Christ has as much validity today as when they first wrote it. Are we being a little hard on the Pharisees? Or maybe we’re being a bit hypocritical since today we are so prone to squabbling among our fellow Christians about things that have little to do with the message of love and forgiveness that Jesus brought to the world and everything to do with the teachings of men rather than of God. Many Christians today are as firmly rooted in their chosen sect to the detriment of their relationship with the Risen Savior Jesus Christ. We need to put the emphasis back the love and forgiveness of Jesus in order to push back the evil forces of Satan that are working to destroy us all. Will you be a soldier for Christ or are you going to be a modern day Pharisee, obsessed with earthly traditions and only vaguely connected to Christ and the Holy Spirit? When the conversation turns to religion and it’s time to defend Christianity are you at a loss for words? I know that I often am — until that night trying to go to sleep when I think of what I should have said. It’s frustrating, and I feel like I should have done better. Gregory Koukl has written a book, TACTICS , that will guide you in how to handle those situations when you have a chance to stick up for Jesus and help guide another soul to Christ. The answer isn’t to deluge them with Bible quotes and assorted facts. That will most likely get you ignored or labeled a nutcase. The answer is to ask them questions about what they believe and to gradually let them see the fallacies and contradictions inherent in their position. Chances are good that a lot of what they say is the “party line” and that they have never really thought about it. Getting them to think so they can explain their position to you can cause them to see they might be wrong about Christ. TACTICS is divided into two sections, first is the Game Plan, how to deal with the non-believer and guide them along towards the Truth of Christ Jesus. The second section outlines several classes of fallacies that are internally inconsistent or that if followed to their logical conclusion make no sense. Asking thoughtful questions based on the flaws in someones positions (flaws which the second part of the book will help you detect) can lead them to begin questioning their unbelief. It should always be done in a kind and considerate manner, not used as a bludgeon. After all, we are Christians and chances are that others are listening in to the conversation. We don’t want to cause the person we are talking to to dig in their heels and refuse to listen, and we want the observers to see us as reasonable and decent folks with honest convictions. You may not have an immediately discernible impact on the person you are talking to, but you may have planted a seed in their mind that the Holy Spirit can work on. The tactical advice is excellent and I know it will help me in the future. In closing I want to mention what touched me the most powerfully. You don’t need to close the deal and get a conversion and profession of faith on the spot. Your job is to put a question in their mind. That question will become a “stone in their shoe” that can open the door for the Holy Spirit to step in and invite them into the fellowship of believers. Only God can close the deal, the Christians job is to be “clear, gracious, and persuasive.” Not everyone is ready to hear the Gospel and you have to accept it, but be on the lookout for those who are open to accept Jesus. If you want to be better prepared to discuss your Christian Convictions, you should read TACTICS by Gregory Koukl. There is nothing in the methodology of this book that limits TACTICS to the defense of Christianity, it applies equally to the defense of any logically held position. I plan to read through TACTICS again to reinforce what Koukl has to say so that I am better prepared to defend Christ than from a single reading. He set about repairing and then sanctifying the Temple which his father Ahaz had defiled. Then Hezekiah invited all Israel and Judah to come celebrate the Passover in Jerusalem. It was too late in the year for the Passover, but it couldn’t be celebrated at the correct time because the Temple had not yet been sanctified. After the Passover celebration was over the people who had been there went out and cut down all the groves, destroyed all the images, altars, and high places that Ahaz had dedicated to evil and false gods. Hezekiah continued with all his heart his work in service to the house of God, and God prospered him. E. Stanley Jones was a 20th century Evangelist who devoted his life to following Christ and spreading the Gospel. He spent many years in India and wrote The Christ of the Indian Road It is full of powerful insights into the Gospel and the best ways to spread the Gospel. In the chapter What or Whom? he points out that when Christians start discussing What they believe conflict arises and causes dissension. When Christians discuss Whom they believe, Jesus, they are brought together. The Church divided once over Whom to believe in. The Unitarians split off, and that is the right thing because they no longer believe Jesus is central. The Church is headed in the right direction if it makes Jesus Christ central and doesn’t worry overmuch about all else. You never know what you’ll find when you read a second hand book. 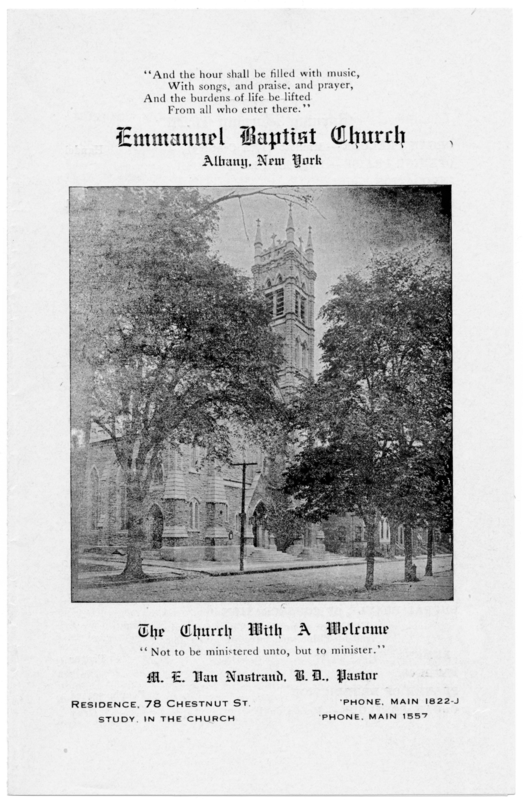 Going through a 1911 printing of The Life of Christ by Ernest DeWitt Burton and Shailer Mathews I came across a Sunday Bulletin for November 19, 1919 from the Emmanuel Baptist Church of Albany, New York. It has four pages 4 3/4 by 7 1/2 inches and appears to have been printed by letterpress. I am reproducing it here since it is old enough and different enough from a typical church bulletin of today to be interesting. In 1896 Charles M. Sheldon wrote In His Steps. It proved very popular and sold millions of copies all over the world. Because of copyright problems he only received royalties on a tiny percentage of them. People thought he was rolling in money, and many wrote to him asking for financial help he was totally unable to provide. Despite the fact that he produced a great deal of written material he wrote very little of a personal nature. Almost ten years later, in 1905, he published The Heart Of The World. It is the story of Rev. Frederick Stanton, D.D. who writes “The Christian Socialist”, a book eerily similar to In His Steps. Stanton, unlike the married Sheldon, is single when the tale begins, but like Sheldon his life is disrupted by the turmoil that results from the publication of the book once it becomes known he is the author. I enjoyed The Heart of the World for its message of the love and redemption that can come from God and for the possibility that the problems and travails of Stanton from “The Christian Socialist” were a reflection of Sheldon’s own turmoil as a result of “In His Steps”. The Heart Of The World is available from KincaidBooks.com as a free download in both a mobi version, HeartOfWorld.mobi and an epub version HeartOfWorld.epub. I’d be quite pleased to sell a few of the print version available on Amazon but hope you enjoy The Heart Of The World. as much as I did whether you read it an an ebook or in print. Although Charles M Sheldon is best known today as the author of In His Steps he also wrote and published many other books dealing with the Social Gospel. In His Brother’s Keeper the plot revolves around two friends who grew up together in an iron mining town. One from a mining family and the other the son of the owner of the largest of the mines. There is a strike and it carries over the summer into the winter when the miners begin to truly suffer. At the start of the novel thirty year old Stuart Duncan, having finished with college, has spent a year in Europe before returning home. He was looking forward to a position in his father’s mining company. The last thing he expected when he stepped out of the train station was to see his best friend from childhood, Eric Vassall, in the bandstand leading about five thousand miners striking against his father and the other mine owners. With the death of his father he was suddenly in control of the largest mine complex in the range. With the miners on one side and the owners on the other Stuart was in the middle. How could he prevent suffering as the snow and cold of winter set in and the out of work miners families were going cold and hungry? Neither side in the strike was willing to compromise and Stuart was only one man. He had plenty of money to spend on the problem, but how could he use it wisely to help those who were truly in need? Stuart knew that if he failed to act to somehow alleviate the suffering the failure would haunt him as long as he lived. His Brother’s Keeper was first read to Charles M. Sheldon’s Sunday evening congregations a chapter at a time in 1895, one year before he read his most famous book, In His Steps, to them in 1896. The Salvation Army plays a prominent part in His Brother’s Keeper and there are the words to several of the songs sung by the Army in the 1890s. A Kincaid Books edition of His Brother’s Keeper is available on Amazon.com. I always wonder if a book purporting to be “Christian” will have anything to do with Jesus or will be some perversion of the true Gospel, so when Speaking of Jesus: The Art of Not-Evangelism showed up as a 99 cent bargain in my Bookbub.com cheap books email I grabbed it. The Gospel isn’t about Jesus, Jesus is the Gospel. “Come, follow me,” Jesus said, “and I will make you fishers of men.” (Mathew 4:19) Thomas said to him, “Lord, we don’t know where you are going, so how can we know the way?” Jesus answered, “I am the way and the truth and the life. No one comes to the Father except through me. (John, 14:5-6) Carl Medearis has spent his life working to win souls to Jesus. He started out ready to dazzle the unbelievers with theology and logic and was discouraged when he had almost no success. Then in interaction with Muslims in the middle east he came to realize that although “Christian” was anathema to Muslims they were fascinated with Jesus. At that point he shifted from identifying himself as a Christian Missionary and just started talking about being a follower of Jesus. Speaking of Jesus: The Art of Not-Evangelism is the story of how Carl changed from a frustrated preacher who couldn’t seem to reach anyone with his message into a powerful force for Jesus in the world. Not only did I find it a compelling and enjoyable read, but it has a profound message: Jesus is what is important, not buildings or liturgies or denominations: Jesus is the Good News. This book may challenge your thinking, but it has a powerful message and is worth reading. Scriptures taken from the Holy Bible, New International Version®, NIV®. Back before digital cameras I took lots of pictures with a variety of film cameras. Mostly 35 mm and 120. I have hundreds of negatives, most of them never printed. 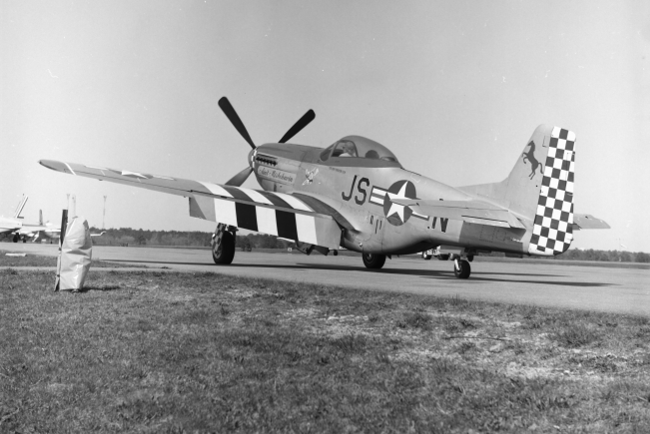 On April 28, 1984 we were visiting my parents on Cape Cod and happened to drive by the Hyannis airport when I did a double take – I thought I saw a Mustang parked across the chain link fence from the parking lot. It had been ten years or so since the last time I had seen one, so I pulled in and parked pretty close. I had my Yashica D twin lens reflex with me, loaded with B&W negative film and shot a roll. I couldn’t get the angle I would have liked to get the pictures of it and I had to shoot through the fence, but I did get some reasonable shots.